Off field matters are dominating for Leeds United this week with talk of transfers in and out and the hearing into Massimo Cellino’s appeal against the decision to disqualify him as the club owner taking place in London. Whether fans will be any the wiser on what is actually going on is hard to tell with Cellino’s appeal heard by the Football League’s Professional Conduct Committee tomorrow, but a verdict not expected for a couple of weeks. By then the transfer window may be closed, so what business United are likely to conduct to try and sort their team out for the relegation scrap they now find themselves in must surely be limited with so much uncertainty hanging round Elland Road. 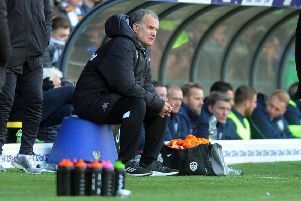 Nevertheless speculation is building about players Leeds are looking to acquire and sell and head coach Neil Redfearn has spoken on how he plans to speak to Cellino about the “two or three” players he believes his squad needs. On Saturday he said: “We will meet up and have a chat next week. Like I’ve said before, our set-up is different in that we have a recruiter and technical director in Nicola Salerno. “I’ve got to get my head together with them and see which is the best way forward, but in my opinion I think we need two or three players to stiffen us up. United were heavily linked with re-signing their former striker, Luciano Becchio, last week, with the player’s agent saying he would be open to offers. Whether the club can afford him or be able to sign him under the restrictions of their transfer embargo, which puts a ceiling on player wages, would certainly be interesting. It could be one out first with Stephen Warnock, who was appointed Leeds captain before picking up an ankle injury, being heavily linked with a move to Derby County, once he gets over the knock that is currently sidelining him. Striker Noel Hunt, meanwhile, had his contract ended last week and others may follow as the club seeks to cut costs again. On the pitch, there was an improved away display at Bolton with Redfearn shaking things up with his team selection and being justified as a more competitive side brought a point back from a 1-1 draw and could count themselves a little unlucky not to have won after having the better chances. The biggest surprise was the inclusion of Sam Byram in an advanced right flank role and he was involved in all of United’s best play, including winning the penalty put away by Rudy Austin that gave the Whites their one goal. They have gone more than 10 hours since their last goal from open play, however, and need to rectify that in back to back home games to come now against Birmingham City this Saturday and against high-flying Bournemouth next Tuesday. Both will be tricky fixtures against sides generally in form in the last month, but Leeds fans will be hoping that their team rises to the occasion as they have done several times this season against the better footballing teams.